Picture - A-7 Corsair II aircraft made by Ling-Temco-Vought. 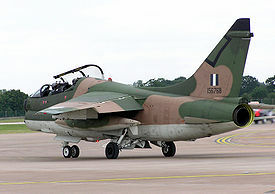 This example, a former USAF aircraft, was photographed at a British airshow in 2005 and is still in use with the Greek Air Force. Ling-Temco-Vought (LTV) was a large U.S. conglomerate which existed from 1969 to 2000. At its peak, its component parts were involved in the aerospace industry, electronics, steel manufacturing, sporting goods, the airline industry, meat packing, car rentals and pharmaceuticals, among other businesses. In 1947, entrepreneur James Ling founded his own Dallas electrical contracting business, Ling Electric Company, where he lived in the rear of the shop. After incorporating and taking his company public in 1955, Ling found innovative ways to market his stock, including selling door-to-door and from a booth at the State Fair of Texas. In 1956, Ling bought L.M. Electronics, and in 1959 added Altec Electronics, a maker of stereo systems and speakers. In 1960, Ling merged his company with Temco Aircraft, best known for its missile work, and using additional funding from insurance businessman Troy Post, they bought the Chance Vought aerospace firm. The new company became Ling-Temco-Vought, with a combined sales of $2.7 billion in 1969. With low interest rates allowing the company to borrow huge sums, Ling proceeded to build up one of the major 1960s conglomerates. As long as the target company's earnings exceeded the interest on the loan (or corporate bond), or the company's price/earnings ratio was less than that of LTV's stock, the conglomerate became more profitable overall. Given the fairly unsophisticated stock research of the era, the company appeared to be growing without bound, and its share prices rose. In 1964 Ling started a holding company and established three public companies, LTV Aerospace, LTV Ling Altec, and LTV Electrosystems (later E-Systems, then part of Raytheon IIS, and since 2002 part of L-3 Communications-Integrated Systems (L-3/IS)), mirroring the original companies that formed LTV. This action raised capital, allowing Ling to raise more loans and buy more companies. In 1965, Ling added the wire and cable company Okonite. In 1967 they bought Wilson and Company, noted for their golfing equipment, but also involved in meat-packing and pharmaceuticals. He later spun each of these divisions into separate companies traded on the American Stock Exchange; they soon acquired the trader nicknames "Golfball," "Meatball," and "Goofball," respectively. 1968 added Greatamerica, Post's holding company for Braniff International Airways and National Car Rental, and J & L Steel. In addition he acquired a series of resorts in Acapulco, Guerrero, Mexico, and Steamboat Springs, Colorado. By 1969 LTV had purchased 33 companies, employed 29,000 workers, and offered 15,000 separate products and services, and was one of the forty biggest industrial corporations. In 1969, investors found that the conglomerates were not growing any faster than the individual companies had before they were bought out. Share prices plummeted, sparking a bear market, and there was a general feeling that the conglomerates were to blame for the market woes. An anti-trust lawsuit was filed that year, and eventually the board of directors demoted Ling in 1970, and he left the company, to be replaced by former LTV executive, Paul Thayer. As part of a 1971 antitrust settlement, LTV sold its Braniff and Okonite components, and Thayer changed the company name from Ling-Temco-Vought to LTV Corporation. In 1975, after leaving the company, Thayer was involved in a suit over fraud in the sale of unregistered securities and was succeeded by former Xerox executive Raymond Hay. The company then went into a series of divestitures, most notably the entire LTV Aerospace division; the aerospace component retained the legacy Vought name as the independent Vought Corporation while the missile component later became part of Loral and later became the Lockheed Martin Missiles and Fire Control division. After the 1984 merger of the Jones and Laughlin subsidiary with Republic Steel Corporation, the company continued to exist primarily as a steel producer, renaming itself LTV Steel, and moving its headquarters to Cleveland in 1993. LTV Steel filed for Chapter 11 bankruptcy on December 29, 2000. The assets were acquired and merged with Weirton Steel to form the International Steel Group. Some of the railroad subsidiaries - Chicago Short Line Railway, Cuyahoga Valley Railway, and River Terminal Railway - went to ISG, while the Ohio Central Railroad System acquired Aliquippa and Southern Railroad and Mahoning Valley Railway. The former Monongahela Connecting Railroad is now operated by the Allegheny Valley Railroad. In 2002, Lombard Metals Corp located in Bala Cynwyd, Pennsylvania, purchased all the outside inventory totaling 224,000,000 lbs of steel from 58 locations throughout the country. Sobel, Robert (2000). The Money Manias: The Eras of Great Speculation in America, 1770-1970. Beard Books. ISBN 1-58798-028-2. Sobel, Robert (1999). The Rise and Fall of the Conglomerate Kings. Beard Books. ISBN 1-893122-47-6. Ling-Temco-Vought Pictures and Ling-Temco-Vought for Sale.